Nothing quite beats the feeling of owning a bespoke painting of your own creation! 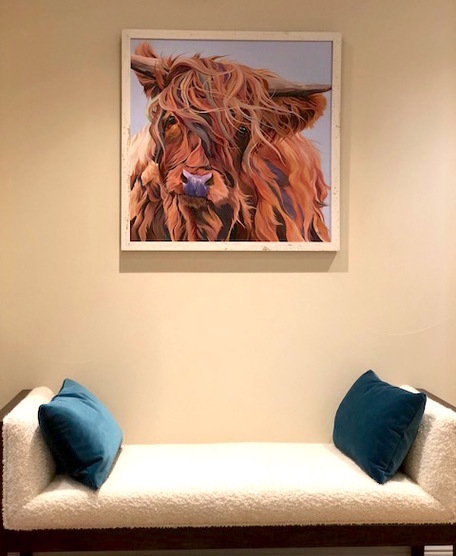 Whether you are a cattle farmer with a favourite cow, have a photograph that you snapped which you would love to see as a painting, or simply have a special request for your ideal piece of artwork. But don't take my word for it, read our testimonials! There are a few check points to tick before commissioning a painting. There isn’t one set price for a commission. There are a lot of variables involved and so each painting is priced individually. To put it plainly, price is calculated by the hours and materials taken to paint your commission. This is determined by factors such as size and complexity. We want to provide you with a quote that is as accurate and as fair as possible, so the more information you can give us the better! Before we go any further; Lauren only paints cows! We hate to leave people disappointed but that is our number one rule. Now on to the painting! All Lauren’s paintings are produced from photos. If you have your own, fantastic! We get some great photographs sent to us that make fantastic paintings with no alterations being made. Other times people have lots of photos of a favourite cow but not the right angle or expression. Don’t worry! We can sort this out! If you don’t have a photo, it’s not the end of the road! We have plenty in the Lauren’s Cows painting pile. As long as you have a clear idea of what you want we can, to the most part, achieve it. However, extra thinking time will mean extra hours. Our standard sizes of paintings are 60cm x 60cm, and 60cm x 80cm. We can go larger than this but generally speaking, these are a good size. We wouldn’t recommend going larger than this unless you have a big space as you don’t want the painting to be overwhelming, and any smaller the painting becomes lost. Bare in mind the larger the canvas the more paint it consumes. But the smaller the canvas the smaller the detail and the harder to paint! It’s a lot of information we know and can be daunting. However a quote is free and nothing compares to having a one off original painting to call your own! Lauren aims to involve you as much as possible on the progress, sending updates and photographs, to create a unique and exciting experience. Scarlett wasn't a commisioned painting however I had to share her story! professional, you all treated us like very important people. She attracts a lot of attention at our home, and it's a delight to see her every time we walk down our hall.We absolutely love the painting- especially her eyes and her smile. (Well, we imagine she is smiling!) "
We chose Lauren’s Cows after we saw your exhibition at the Yorkshire Dales Food Festival last year. We bought a print and loved it so much decided we would like one of her commissions. 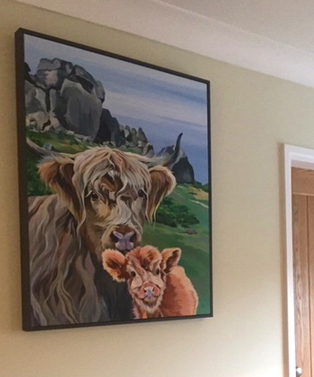 The painting was a gift to each other for our engagement and the subject itself means a lot to us as the back drop is the Cow & Calf where we live nearby and have enjoyed many family walk together. Our experience was excellent Lauren kept us updated and we also met her at her studio in York and looked at other pieces of hers. The result is just what we wanted and more it gets so many lovely comments from everyone who sees it ! We love it! Mark & Louise from Addingham ilkley. 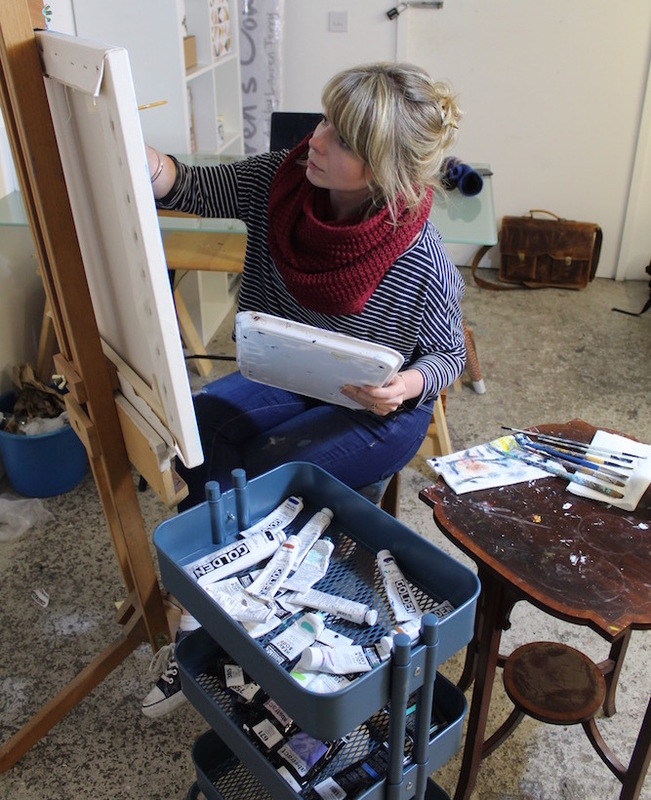 "I didn’t know I wanted to commission a painting until I saw Lauren’s Cows on Twitter. I was hooked by your quirky, individual style, that had me wanting to reach right out to your cows. 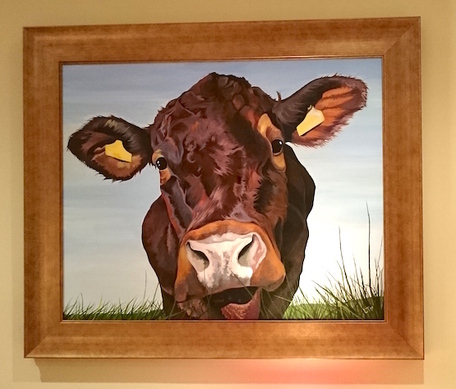 I asked to paint one of our cows, Lark, for my wife, Jill's birthday present - and it's been such a brilliant success! 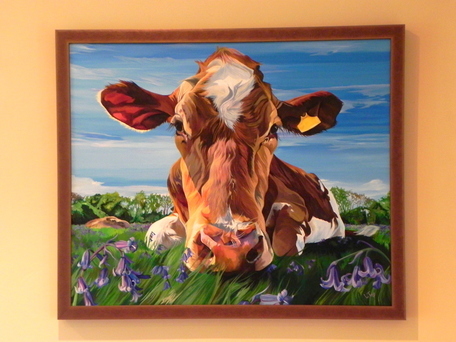 We loved it so much that I couldn’t help commissioning a second one, Bluebell, our Guernsey. It's so perfect and captures the essence of our house-cow. Can't imagine life without them now! "Yeah that's fine for you to collect it and meet me- unless you’re a murderer? Then maybe it's not such a good idea! Either London or Scarborough, take your pick." It's been brilliant – you know exactly what image you need to create an outstanding painting, lots of feedback, no faffing, straight into it, and you really listen. I know where I am money-wise and the painting far exceeded my dreams. It's the best investment we've made. 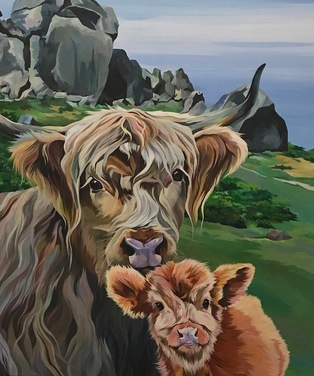 It’s priceless to own such a personal painting and a beautiful interpretation of our cows at that snapshot in time – their youthful faces gazing at you happily ‘through the window’."